First of all: thanks to the Oolite team for their detailed explanation of the planet generating algorithm (here and here). 1. Planet Names: why are some of the two-character parts left out? See for example the second planet "QUBE": the second part of the name has the value 0 and is therefore empty, that's clear. But the fourth part in the w2 hsb would be 1101 (decimal 13), which would be "DI". How do you decide that this part is not included in the planet's name? 2. Planet radius: according to the wiki, for the first planet TIBIDIED it should be 256*(11+7) = 4608. The original BBC game and Oolite show this value as 4610 (obviously rounded). The Elite DOS games (Elite and Elite Plus) show the radius of TIBIDIED to be 7103 km. I would like to optionally generate the DOS radius value. Has someone already figured out how to do this? Can you please explain what bit patterns are used to determine these values? Hi and welcome. Sorry for the delayed reply, but Oolite has moved away from the procedural planet data generation since version 1.82, so I had to go back and find the source code of v1.80 in order to help you with your questions. Unfortunately, with 1.80 being so old, it is a bit difficult to test stuff. So I will just provide the relative algorithms here and I hope they will be of help. It looks that things might get dropped under certain conditions related to the system seed a and f components, as well as when the second character of the selected digram is the apostrophe. Hope this helps. Feel free to ask if something requires further clarification. Thanks, that helps a lot! Now I know why I couldn't find anything helpful in the current Oolite source. Could you please explain what parts of the seed values w0, w1 and w2 the s_seed.a through s_seed.... values correspond with? I assume that each one is either the hsb or lsb of one of the three seed words, but in what order? Population and Productivity are easy to calculate as they are simply based on the other values. And can you please search the old source for how the Inhabitants Type (e.g. "Human Colonials") is determined? Not really sure what the w0, w1 etc. refer to. Not sure about the correspondence, as I am not famiiar with the old Elite code. Regarding the second question, here is the source of the method that was doing the system descriptions in 1.80. The arrays under the system_description container array in descriptions.plist were used to build up the system description phrase. // Avoid recursive %I expansion by pre-seeding cache with literal %I. // TODO: profile caching the results. Would need to keep track of whether we've done something nondeterministic (array selection, %R etc). The string that sets the description domino going is in descriptions.plist: "system-description-string"	= " is .";. This, together with the system seed is passed to the above method for expansion. Sorry for the late reply, I was busy with other projects. Thanks, I didn't notice that the inhabitants type is expanded just like the planet description string, I thought these were simply constant values. Finally, could you please check the old source once more and tell me how seed.a through seed.f are initialized when the sequence starts at the first planet (Tibedied) of the first Galaxy? 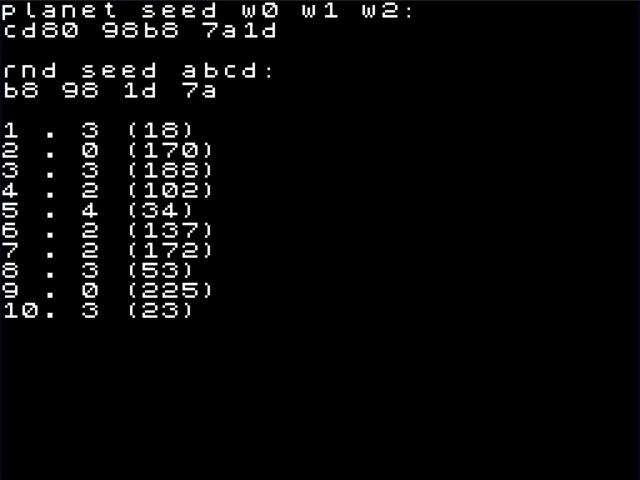 That should clarifiy how these compare to the seed words w0, w1 and w2 from the Wiki description. till a_c comes in, feel free to check our previous releases archives, where source code is also available. My "Elite Planet Browser" is basically complete now and running on 40 different systems, the only thing that's left to be done is the planet description string. I understand the basic concept: it all starts with " is ", and each [..] is expanded using "system_description" from descriptions.plist, returning either a string or recursively leading into another expansion. But I still haven't figured out how exactly the pseudo-random index (based on the planet seed) for which of the five description items to use is calculated - the way I do it leads to wrong values. "Qube is reasonably well known for its great dense forests but scourged by deadly civil war." The resulting index is the value in the middle, which is the value in parentheses modulo 5. Here is my code just in case that any of you want to take a look at it. For the planet seed I am using the w0 /w1 / w2 notation from the Wiki page, see my posting above. So something is wrong, but what...?